About SBI! utility page and content 2.0 pages, I researched SBI! 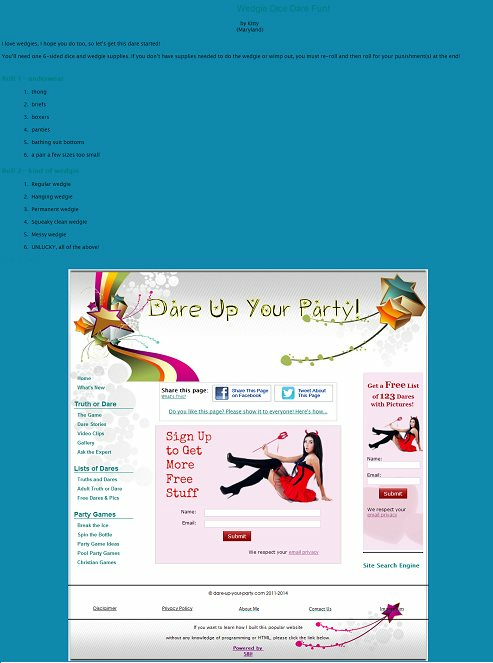 forums for a solution and created another utility page using the basic design shell and uploaded it to party games website. Although it hasn't worked so far, but I am very hopeful that this will work out well. Next Day Update: Changes I made yesterday did not work out well, all C2 pages are still messed up. Content was not placed at the right place. However, I was very close to the solution so I played around with the HTML file and C2-utilitly-template little more, found and implemented the solution. Although the changes are not live right now and I think it would take some time to update, but I am 100% sure that this will work fine this time. Moved the Hockey Strip story to members' area invitation and also uploaded the image to it. I was not sure about it, but I have used a "nfollow" "noindex" tag for this story at the moment, please let me know if you want to remove it. Also added links to "member's area, edit profile and logout" within the SBI! include so that it shows up on every member's C2 page like a SWdot. Also submitted some more stories from explicit content folder to test them and everything is working fine. Submitted all stories with "noindex" and "nofollow" tag. If we don't want to index and follow these pages by search engines, I think it makes sense to add "noindex" and "nofollow" to SBI! include because this way we don't need to add this on every blogpost. C2 comments width is also restored to actual width. Created a membership form and inserted within the page. I know that you don't plan to use this form on this page, but I have created one and we can copy paste the HTML code to use anywhere. Updated "Explicit and Real Truth or Dare Stories" section with expand/collapse tags and images. There are still a lot of open tasks for me to work on. Created a manual for tier page and content 2.0 pages explanation and shared it with Jomvie. Had a 2 hour Skype discussion with Jomvie. Discussed many projects and tasks with him especially Sotam and Infographics task and tried to clarify and explain different aspects of both tasks. Brainstormed a lot of keywords for Eric interview page, but didn't find any good keywords. Most of the keywords related to 'Virtual assistant communication' we already have used. I have used different options including vertical brainstorm, lateral brainstorm, and seed generator brainstorm but could not find a good keyword for a Tier 2 page. Uploaded 2nd part of the Eric's interview, please have a review of Administrative Virtual Assistant. Did not distribute it via RSS.